Cameron: Hi, I'm Cameron Stauch, and my new cookbook is Vegetarian Viet Nam. Suzy Chase: It was so great to meet you at the International Association of Culinary Professionals, IACP Conference, last weekend here in New York City. Do you have any fun highlights from the conference, other than meeting me? Cameron: Meeting you was great, that was great that we were able to connect in person, so that's always wonderful. Yeah, you know, it's always great to see friends, and then to also see other cooks or writers or journalists that you kind of see their names on Twitter in real life, but there's some really interesting panels. I was really taken, though, with this guy name Mike Lee, who I think he has a website called The Future Market, so he's looking at trying to solve different food issues with thinking about the future, and thinking kind of really out of the box and seeing which ideas that he has will take, will stick, and people will go with. So he's looking at different stuff like edible wrappers, instead of getting rid of plastic. He was talking about a cracker where they're planting like different types of grains with different types of legumes, so that it would be like a grain and a bean together as a cracker. And then it would change with the seasons or with the growing cycle, so these two things would be growing together at the same time. But they're really doing is they're putting nutrition back into the soil, the nutrients back into the soil, so they're really looking at regenerating the soil is the main goal, and then the byproduct is using these ingredients to make crackers. So I found those type of ideas, that normally I don't think about, to be really fascinating. Suzy Chase: Okay, first off, talk about that day in late 2012, when you took to the streets of Saigon to explore the food stalls. Cameron: Sure, well at that time, I think a few months earlier, I had just moved to Hanoi with my wife and family, and I wanted to kind of, you know, look into the food of the country, and so did a short trip to Saigon. And I'm not a morning person, but only when it comes to food, food and markets will get me up early. So it was an early morning, I woke up early, threw on my clothes, and I was hungry, so I was wandering the streets and I was trying to get to the nearest market. And generally outside the markets, you'll have some really tasty food stalls. And I came upon one, where it seemed like a good sign. There was a bunch of eaters, they're all hunched over their bowls, everybody's kind of quiet, so I thought okay, this must be a good one. So I went in, I just motioned for a bowl, started eating it. Kind of thoughtlessly, actually, and I thought this is a really good bowl of pho. And then, I realized that it was vegetarian, and it was the first kind of really great vegetarian pho that I'd had. And it had mushrooms, daikon, carrot, and had these kind of really nice chewy fried sticks of tofu skin, that had been fried and then simmered in the broth. And then the broth had all the flavors that a traditional beef pho would have, so the anise, the cinnamon. And then of course it had the herbs, the culantro, Thai basil, cilantro. So I was just taken with it, and so I wanted to look more into the vegetarian side of Vietnamese food. Suzy Chase: You've lived in so many places around the world. What about Vietnam compels you to do this project? Cameron: You know, there are several things. One of the first things is, being a chef, especially coming from North America. When I was learning to be a chef, Alice Waters was really taking off, and so learning about where your food was coming from, sourcing it, and the traceability of it. And so when I moved to Hanoi, that was really hard, where you could go and see the meat and seafood in the market, but it was really hard to find out where is it coming from, and how are those animals being treated, and how's the seafood being caught. So that was something that we had in mind as a family, so we started to eat a little bit less meat just for those reasons. And then, my young son at the time, I think he was about four years old, announced one day that he was gonna only eat vegetarian. So our family meals had to change a little bit that way. And then I was just coming from a job, where part of my job was to take care of dietary restrictions, and a big part of that was the vegetarian meals, so it was already in my mind thinking about vegetarian food. And then, as I looked around, I noticed that in Hanoi there'd be pockets, little kind of days where I'd go past a temple, and there'd be just vegetarian food at the temple or at the pagoda, and I didn't really understand why. And then talking to a friend who had been there for a while who's vegetarian, he mentioned that going to the center and the south there's more vegetarian food that was more prominent. So I thought it was something that I was interested, to do more research. So it was just a collision of things that kind of came at the right time, where I thought, I think there's something here that I wanted to look into. And I recognized that there was a need for such a book, because there wasn't a book out in English on Vietnamese vegetarian food. There's great books on Vietnamese food, but nothing that solely looks at the vegetarian side of things. Suzy Chase: How did you collect the recipes? Cameron: You know, I guess I go about through a few different methods, where sometimes it's a matter of going out eating the street food or eating at restaurants, and then kind of checking to see what are the consistent ingredients in them. You know, I was fortunate enough to cook with monks and nuns in different monasteries, and monks and nuns in Vietnam eat all vegetarian, so that was a great thing to do, was to spend two or three days in each different type of monastery to see what they would how, and how they would treat things. And then I was also able to cook with home cooks. A lot of people in Vietnam, they're very proud of their cuisine and of their culture, and I was able to learn enough of the language to communicate with them in an elementary way. But they would invite me into their homes if I showed some curiosity, so I was very fortunate to also do that. So it was just a combination of things, of people sharing their recipes, sometimes it's me seeing okay, I can come up with this recipe myself. Or, there were a couple recipes that are meat-based, that I hadn't seen a vegetarian version, but it was easy for me to come up with a vegetarian version. So there's different ways that I was able to do that. Suzy Chase: So in North America, vegetarians and vegans often embrace these alternative diets for environmental, health, or moral reasons. Is that the same in Vietnam? Cameron: I think increasingly, yes. I think that what's happening in Asia, particularly, right now is people are seeing the impacts of a certain type of Western lifestyle on the environment. And people are increasingly more concerned about their health, because again, I'm seeing a lot more things pop up in Vietnam, and also here in Thailand where I live right now, about the traceability of food. People wanna know where their food's coming from, and there seems to be a greater demand on organic ingredients. But in Vietnam as well, there's a religious aspect where the lay Buddhist believer will eat vegetarian maybe once or twice a month as a rite of abstinence of purification, so they're doing it to hopefully bring good luck, or to avoid bad luck for themselves or a family member. So that would be the other aspect of it in Vietnam. And also what's interesting is, I believe something like 60% of the population of Vietnam is under the age of 30, so I think these environmental and health and moral reasons are gonna kind of come to more of the forefront than what traditionally it was more for religious reasons. Suzy Chase: Give us the history of the vegetarian culinary replications approach in Asia. Cameron: My understanding is that Chinese monks in China would want to invite non-Buddhists or just locals into their monastery, and they would eat vegetarian but the locals would not. So what they would do is, they would make dishes that looked and tasted as much as they could similarly to the meat and seafood dishes, so that was a way to kind of welcome the people in, and to make them feel more comfortable eating vegetarian food. And that type of idea filtered down into Vietnam through the religion, and then into the kitchens, where people would make a replica of the dish. So you'll see it on menus, where the names will be the same name as the meat or seafood dish, with the work chay, c-h-a-y, on the end, so that indicates that it's this type of meat or seafood dish, but it's a vegetarian version. And another signifier too, is the way that they garnish the dish if they're using the same herbs or the same garnishes, that's another indication that okay, this is vegetarian, it's supposed to be replicating this dish. Suzy Chase: That is so interesting, I'd never heard of that before your book. Cameron: Yeah. And you know what, it was a good way for me to see the see differences and similarities in what the cooks were trying to do, so to be able to see and taste meat and seafood version, and then see and taste the vegetarian version. It was good for me to know that. And actually, the first two times that I went into vegetarian restaurants, it kind of threw me, because I was like, wait a minute, this meat dish, this is a seafood dish. And then, as I learned more Vietnamese, more about vegetarian food in Vietnam, I was like oh this is just signifying to people. This is like this dish, so if you like that, maybe you might want to try that again. Suzy Chase: In regard to street food, why should we pay attention to the lunar calendar if we're traveling to Vietnam? Cameron: As I was talking just earlier about the lay Buddhist eating vegetarian once or twice a month, so typically they will do it around the new moon and the full moon. So they might eat it one day on the new moon day, and one day on the full moon day, or they might eat it two days around each of those. So what's interesting is some of the street food vendors will switch from their meat and seafood dish, to a strictly vegetarian one. And I think also what I should point out, too, is when I say vegetarian, I'm also really meaning vegan as well, because a lot of the vegetarian food falls into the vegan category. So I had one day when I was on a research trip, and it was one of my first trips, where I was in the city of Hue, and I'd gone to this street food stall for some noodles. And it was just fantastic, and they were vegetarian, I said this is great. And so I thought, I'll go back the next day, and then the next day she was back to selling her beef and pork noodles, and I was like why is this? I didn't know yet why these things happened, so then I was able to learn about following the cycle of the moon. So if you're traveling, that's also important. And also what's important, too, is some restaurants will do like these elaborate buffets for vegetarians on that day, 'cause they know that they'll get a rush of people, so it's easier for them to prepare a quantity of food, and put it as a buffet 'cause they'll have more diners than they regularly would during the other days. So those are things to look for, if you're traveling to Vietnam. You know, follow that new moon and full moon cycle, and you should be set. Suzy Chase: Way before this project, you were part of the kitchen team that cooked for the governor general of Canada. Tell us about that. Cameron: It's similar to cooking at the White House, so we would do cooking for events like a state dinner, or we'd cook for the cafeteria for the staff there, or for the governor general and their family. So I was lucky to cook for the last three, in between living overseas, and one of my jobs there was when we'd have a big event, was to take care of the dietary restrictions, so whether it was somebody who was vegetarian, vegan, gluten free, or they had a certain allergy. So what my job was to make replicas of the plates that we were serving, to try and make it look and taste similar to what people were getting, and actually my goal was to make it taste better so that the people at the table were like, "Oh, what's that? I want that," instead of the main thing. So I was able to take those skills from the kitchen, and then when I was doing the research for this book, kind of used similar skills in looking at, like okay, if I had this person, how would I treat this, and how can I make this dish into something that's vegetarian, if I needed to do it, if I hadn't seen a vegetarian version. Or, if I did see a vegetarian version, I was what are the steps, are they replacing for the texture or for the flavors, by not having the meat and seafood there. Suzy Chase: You also cooked for Queen Elizabeth, right? Cameron: I did. I actually cooked for Queen Elizabeth and her husband, Prince Charles and Camilla, and Will and Kate, so I've cooked for three generations of the royal family when they visited there. Suzy Chase: That's so cool. Suzy Chase: They were bickering at the table? Cameron: They were not there at the same time, but what I mean is, the older generation wanted something simple but tasty, nothing too crazy, so it was just more like maybe a piece of nicely cooked fish or meat with some nice vegetables, but simple. You know, Prince Charles is very into organic food and where his food comes from, so we focused on that. And then, when Will and Kate came, they basically said, "Surprise us, we'll eat anything." It was really interesting to learn that Kate also genuinely loves to cook, and so she was asking us questions, and we actually had some culinary students there helping us make the food that day. She was asking them about cooking, and she showed that she is really, really into just learning about food, and wants to learn herself, so it was fun. It was just like the three generations of our own families. Suzy Chase: I'm dying to know about Cam Van, Vietnam's Julia Child. Cameron: She basically, I believe in the late '80s or early '90s, she was a literature teacher before, and somehow she got a cooking job in like a culinary institute, and then someone asked her to be on TV. And she just had a manner about herself, a quiet, assured manner, but she was also a really good teacher, and so she had this very popular cooking show on TV in Vietnam, she had a newspaper column. She ended up writing over 40 booklets of different Vietnamese recipes from all around the country. So she in a sense taught a lot of Vietnamese people how to cook in their homes if they're watching that, because of having all the wars, there wasn't as much of a written history of their food, so Miss Van was a way to teach people about these different dishes that maybe they had heard about from their relatives in different parts of the country. And cooking with her was just a special day, so she taught me some vegetarian recipes, some of her family favorites, like a young stewed jackfruit with Vietnamese coriander just stewed in soy sauce and sweet soy sauce, or a tofu skin sausage that you can use in bahn mi or in soups. But she's just a lovely person, and she's had a big influence in Vietnam in teaching people about their own food. And when I told people that I had the chance with her, they knew who she was, so she's a big deal, and it was an honor to cook and learn from her. Suzy Chase: I read that during an introduction of Vietnamese cuisine at that Culinary Institute of America in 2000, she showed a bottle of fish sauce, a bottle of vinegar, a glass of lemon juice, several kumquats, onion, garlic, and ginger, and she made 16 types of sauces for 16 dishes, out of those ingredients. Cameron: Yeah, I wouldn't be surprise, one, that she has the ability to do that, but it also shows the variation in sauces that occur throughout the country. So yeah, no, she's a special woman, so I wouldn't be surprised that she was able to do that. Suzy Chase: I love how you put the pantry staples chapter at the beginning of the book. So many cookbooks bury it in the back. One integral staple is vegetable stock. Describe your favorite go-to vegetable stock. Cameron: In the book, I offer two different vegetable stocks, a light vegetable stock and a rich vegetable stock, is what I call it. And I offer two, because they work with different recipes. One might require a lighter stock, and one might more richer stock, so I kind of look at them as a chicken stock and like a veal stock or beef stock. So with the rich vegetable stock, I use onions and carrots, some celery, garlic, a small amount of plum tomato, and I'll cook that in a little of oil. And then, I'll kind of stew that for a little bit, maybe for five, ten minutes, probably ten minutes, and then add some dried shiitake mushrooms, some fresh mushrooms or some eggplant, and a little bit of salt. And then add some water, bring it to a boil, and then I'll simmer it for about 45 minutes to an hour. And I find that especially that addition of the dried shiitakes and the eggplant or fresh mushrooms, just gives it an extra body to it, gives it a bit more richness in flavor. And what I like is that it's versatile over different types of cuisines. You know, I tried to keep it fairly plain-flavored so that you can use it for other types of cuisines, and not just recipes in the book. Suzy Chase: So the other night, I made your recipe for Lemongrass Chili “Chicken” Strips Stir-Fry on page 71, and I used some grilled vegetarian chicken strips from Trader Joe's, and the lemongrass made it such a lovely, fragrant, hearty dinner. Cameron: What I really like about that recipe ... Now traditionally in Vietnam, they would serve it with cubes of deep fried or shallow fried tofu. You know, there's some new faux meats out there. For example, the ones from Beyond Meat, I'm a fan of their Beyond Chicken. And I kind of think that if some Vietnamese vegetarian cooks, if they had access to this ingredient, I think they'd use it. So I wanted to kind of play around with that as an ingredient for people who use it, but you can substitute it with tofu. But what's great is lemongrass, the chili, the little bit of garlic, just kind of brings everything, it just pops in flavor, and then just a little squirt of lime juice, then a little bit of cilantro. Just in one bite, you just kind of get this nice explosive flavor of the lemongrass and the chili and the garlic. Yeah, and also the great thing, too, is for leftovers, you can use them in a salad, you can use them in a bahn mi sandwich, or if you're using it for a different type of sandwich. You could even, if you wanted to do some rice paper rolls, and you a little bit extra, and through it in with some slices or julienne vegetables, put it in there with some herbs and lettuce. Suzy Chase: A recipe in the cookbook that caught my eye was the green banana tomato tofu soup. Describe that. Cameron: One of the first weekends that I was living in Hanoi, I took a food tour with a food guide who soon became a close friend too, and he took me down this alley. And we had this dish, but we had the non-vegetarian version first, which was the green banana, tomato, and tofu, and then there's a little bit of snails in it as well. And then about a year later, I started going to this one vegetarian restaurant near my house, just this really small shop, and I was looking at it and I said, "Wow, that looked like a similar dish." And I was speaking to them, and they said yeah, this is the vegetarian version. And so what it is, is I learned it from my friend Ling and mother [foreign language 00:23:16], and what it is it's green, unripe bananas, not plantains, so it's a good differentiation to know that. So your unripe bananas, and you can peel them as much as you can, and then you kind of either put them in finger-length pieces or slice them, and you first blanch them in tumeric-infused water. And that helps remove the stickiness and a little bit of the bitterness. And then you take them out. And then you just stew them this nice stew of tomatoes, some tofu, you've got some shallots, a little bit of tumeric. And then you garnish it with some finely sliced betel leaves or shiso leaves. And then, you can either have it just as a soup like that, which is what they typically would do in the northern countryside, in someone's home or something like that. Or, you can have it just over a bowl of vermicelli noodles. Suzy Chase: What's the flavor profile? Is it more banana-y or more tomato-y? Cameron: Well, it's not gonna have any of that banana flavor that you think of as a ripe banana. So I would say the tumeric is probably a little bit more pronounced, and then you will get the tomato. Green banana is a bit more of the starch, you know, so thinking of it as like a potato in the stew type of thing. So it adds that texture, and also you have to look at these green unripe bananas, in the countryside, they're growing all over on banana trees right around the house. So most likely, I'm assuming, this dish came out of a time of poverty where they didn't have much to use, but they had these unripe bananas on the tree, and they thought what can we make with this, so that's how it came out. And instead of using ... Sometimes what I like to do is add some sauteed cubed pieces of portobello mushrooms to kind of mimic the earthiness of the snails, sometimes I'll throw that in as a little extra flavor and texture. Suzy Chase: What's up next for you? Cameron: I'm living in Bangkok, Thailand right now, and so I'll be here for another year and a half or two years. So I'm thinking of looking up the vegetarian food here in Thailand, or seeing about what's out there. There is a festival in late September, October every year, so that's something that I'll look into. A few other projects, but one thing that I'll be doing that I'm excited about is this November, I'm doing a culinary tour of Vietnam, I think around the 4th of November to the 14th, with Best Way Tours in Vancouver. And we're taking a small group, eight to 12 people, and we're gonna go from Hanoi into the center to Hue and Hoi An, and then go into Saigon, and then into the Mekong. And we'll be cooking with home cooks, some of the people from the book, some of my friends that I've met, do some street food tours, so I'm really excited to be doing that. Cameron: Yeah, so on Twitter you can find me @CamCooks, c-a-m-c-o-o-k-s, and on Instagram and Facebook you can find me at A Global Kitchen. Suzy Chase: Naomi Duguid wrote, "Cameron's easy style makes you feel that you a friend at your side to guide you as you shop and cook." It's been so much fun chatting with you. Thanks so much for coming on Cookery by the Book podcast. Cameron: Oh Suzy, it's been a joy, and I hope that I can be on at some other time in the near future. 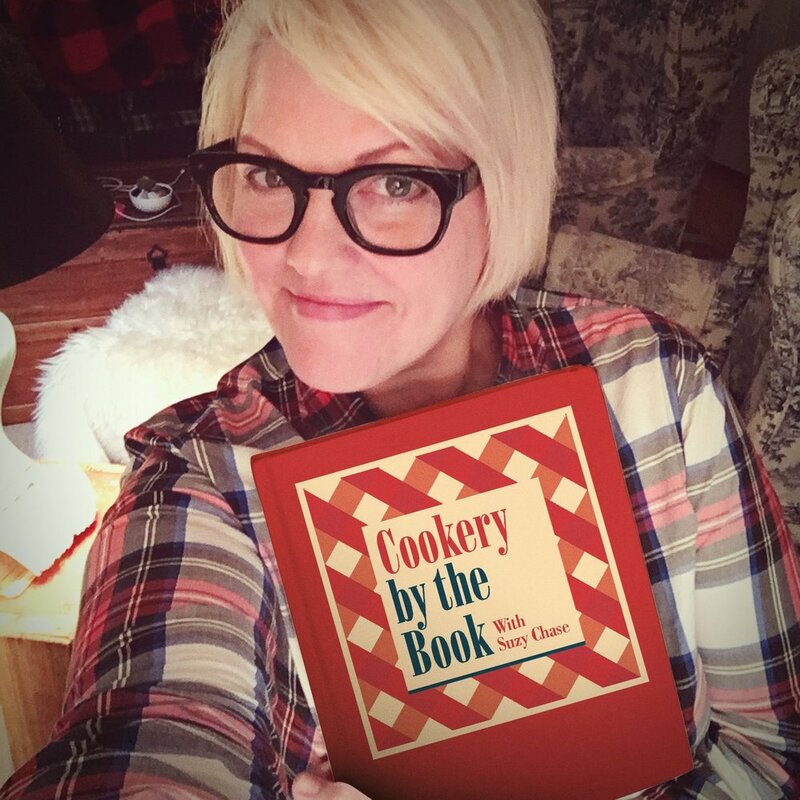 Suzy Chase: Follow me on Instagram at Cookery by the Book, Twitter is @IamSuzyChase, and download your Kitchen Mix Tapes, music to cook by, on Spotify at Cookery by the Book, and as always, subscribe in Apple Podcasts.